45 years fishing for stripers: Capt. 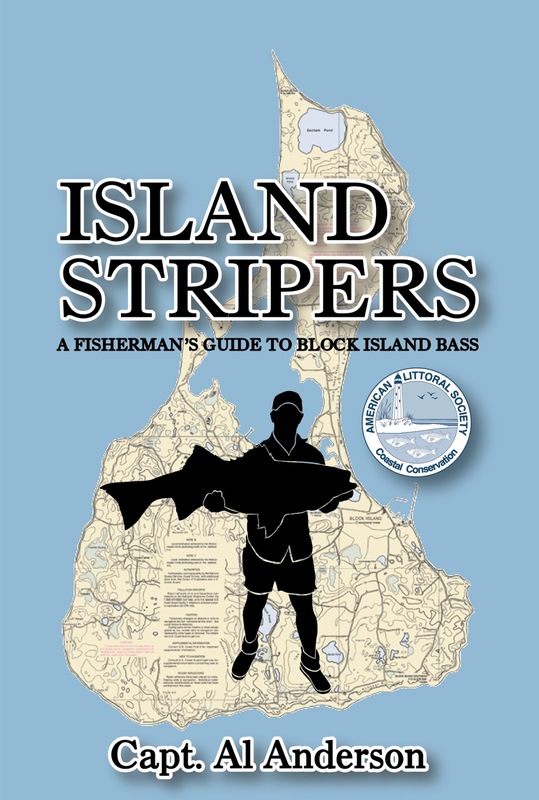 Al Anderson’s latest book, Island Stripers, is the result of countless hours of charter fishing at Block Island. 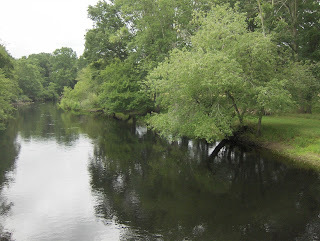 Open access to the Pawcatuck: Thanks to DEM’s purchase of four acres along the Pawcatuck River, Westerly, RI those fishing, canoeing and kayaking now will have better access to the River. Last week, the Striped Bass Advisory Panel of the Rhode Island Marine Fisheries Council voted not to recommend a ban on a certain type of “yo-yo” fishing rigs. Lead “yo-yo” rigs are used by some commercial and recreational rod and reel fisherman. The number of anglers using them is not known, however, commercial rod and reel fishermen at the meeting and on the panel said they use them. The practice of yo-yoing involves inserting a lead weight into a dead baitfish such as an Atlantic Menhaden and the use of a rod (wood or metal skewer like a coat hanger or a wire) in the fish to maintain its shape and control it like a puppet when sent to the bottom or to various depths in the water column. The bait is then moved up and down (like a yo-yo) to mimic a bait fish in distress to attract striped bass to the bait. The bait is effective in attracting large stipend bass for those that have mastered the technique. It is practical because you do not need a live well to keep bait live, you can catch and prepare them ahead of time and it is far less expensive for commercial rod and reel fishermen than buying live eels, another popular way to catch large bass. Some commercial striped bass rod and reel fishermen who fish often to catch their quota of fish in season have found it a practical and effective way to fish. The Panel heard testimony from commercial fishermen on the panel that the lead found in the bellies of striped bass is not harmful to the fish because they catch fish that have lead in their bellies and they are alive. Others said that there are many other commercial and recreational fishing techniques used that contribute greater to the mortality of striped bass and that they were being singled out. Techniques such as up-fishing by commercial draggers (the practice of continuing to catch bass until you catch the largest fish possible discarding smaller striped bass that to not survive after release) and recreational anglers that put too much stress on fish by fighting them for a long time and once released they do not survive. The issue before the Panel referenced a proposal from Massachusetts that advocated for a ban on just certain types of yo-yo rigs. The Rhode Island proposal was to allow yo-yo rigs as long as the lead weights were attached to the terminal tackle (so the weights could be pulled out of the bait fish and retrieved). This proposal was rejected by the Striped Bass Advisory Panel with members relating that “no scientific evidence”, “no studies” exist that proves lead ingested by striped bass is harmful to the fish. Capt. Al Anderson has produced a new presentation about his latest book and tag & release efforts and is reaching out to fishing clubs and organizations interested in having him as a quest speaker. Capt. Anderson is the South County charter captain that was inducted into the IGFA’s World Fishing Hall of Fame in 2012 for his conservation ethic and noted authoring in the fishing world. His latest book, Island Stripers, is the result of countless hours of charter fishing at Block Island. Contact Capt. Anderson at ahatuna@aol.com or 401.783.8487. The 20th Annual Providence Boat Show is being held this Friday, January 18 from 10:00 a.m. to 9:00 p.m.; Saturday, January 19 from 10:00 a.m. to 9:00 p.m.; and Sunday, January 20 form 10:00 a.m. to 5:00 p.m. at the Rhode Island Conventions Center. Show organizers expect a great show. Tickets $10 at the door. Visit www.providcenceboatshow.com for a list of exhibitors, online tickets, etc. The Department of Environmental Management (DEM) has acquired four acres of land in Westerly that will enable the creation of an excellent fishing and boating access site on the Pawcatuck River. Located on Post Office Lane, the property includes over 500 feet of river frontage. In conjunction with DEM’s purchase of the land, the state obtained an easement across the right of way from Potter Hill Road which will be used by the public to access the riverfront. DEM is having a series of three RIMFC advisory panel meetings that impact recreational fishing on January 30th. The status of fisheries, policies and regulations that work their way into DEM species management plans are discussed at the meetings. So, now is the time to let your voice be heard by attending advisory panel meetings. Visit www.dem.ri.gov (Marine Fisheries page) for agendas. The three panels include a tautog meeting at 4:30 p.m., a summer flounder advisory panel meeting at 6:00 p.m. and a black sea bass and scup panel meeting at 7:30 p.m. This new format, offering multiple advisory panel meetings on the same night, hopes to enhance angler attendance at the panel meetings. All meetings will be held at the URI Bay Campus, Coastal Institute Building in the Hazard Room on South Ferry Road, Narragansett, RI. 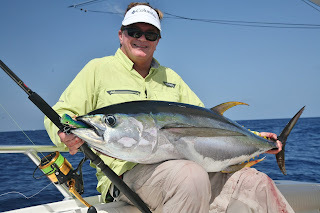 Learn how to catch big fish: Seminar host George Poveromo with the 55 pound yellowfin tuna he caught with a Williamson Jet Popper top water lure and a Penn Spinfisher V 10500 reel spooled with 50 lb. test braid. The Salt Water Sportsman National Seminar Series will be held in Providence, Rhode Island on Saturday, February 2, 9:00 a.m. to 4:00 p.m. at Roberts Hall Auditorium, Rhode Island College. George Poveromo, host of George Poveromo’s World of Saltwater Fishing on the NBC Sports Network, and editor-at-large for Salt Water Sportsman, will headline the program, along with Tom Richardson, noted New England angler and a prominent fishing writer and editor. Joining Poveromo and Richardson in Providence will be Dr. Mitchell Roffer, a leading authority on locating surface temperature breaks and ocean-circulation features that hold fish; Harry Vernon III, nationally recognized authority on offshore trolling and day-dropping for swordfish; Captain Corey Pietraszek, Buzzards Bay and Elizabeth Islands light-tackle striped bass, fluke and blackfish pro, with his Plug N Play Charters; Captain Zach Harvey, renowned authority on fishing the coastal and offshore waters, and fishing writer; Captain Brian Patterson – renowned Rhode Island and Cape Cod light-tackle striped bass, bluefish and bluefin tuna pro who operates Patterson Guide Service; Captain Dave Monti, veteran New England pro, charter captain and fishing columnist with 40 years of experience fishing Narragansett Bay; Captain Andy Dangelo, distinguished authority on catching tuna, and sharks, as well as trophy fluke, blackfish and cod with his charter boat, Maridee II; and Captain Alex Friedman, premier authority on big game fishing in New England waters, and also a noted trophy fluke and striped bass specialist with his Martha’s Vineyard-based charter boat, Dazed and Confused. Topics covered will include: striped bass fishing tactics… live-baiting for trophy bass, spinner-and-worm fishing, top water lures, diamond and flutter-jigging for striped bass and bluefish, chunking, inshore wire-line techniques, and secrets of fishing the rips. Bluefish tactics will include, how to keep track of and locate the largest bluefish in the Sound, surface lures and other artificials. Trophy fluke tactics include how to chum up big fluke and tactics on bottom-fishing for inshore table fare (flounder, black sea bass, blackfish). Blackfish or tautog jigging tactics and bucktailing for trophy black sea bass as well as tricks that take more offshore cod and Pollock. Tuna and shark tactics will also covered in the seminar. New this year will be a special Kid’s Seminar from 12:00 to 1:00 p.m., presented by Sperry Top-Sider. The kids will participate in a meet-and-greet with George Poveromo, have chances to win special door prizes, enjoy a free lunch courtesy of Sperry Top-Sider, and have their names entered into a Grand Prize drawing to win a Florida fishing trip with George Poveromo. One child, 15 years and younger, per paying adult, will be admitted for the full day at no charge. Register by calling (800) 448-7360, or visit www.nationalseminarseries.com.. The Roger Williams University Center for Economic and Environmental Development will is enrolling students to its non-credit course in Practical Shellfish Farming for the winter 2013 semester. The course provides the technical information needed to undertake a small shellfish farming enterprise in Rhode Island or nearby southern New England. All aspects of shellfish farming will be covered over the fourteen-week course. Students will learn the basic principles of hatchery, nursery and grow-out operations; as well as risk management, siting and permitting, and business management. Associate Professor and Aquaculture Extension Specialist, Dr. Dale Leavitt, will instruct the course which will be held in The Marine and Natural Sciences Building (Room TBD) on the Bristol, R.I. campus of Roger Williams University. The course will be held on Tuesday evenings from 6:30 p.m. to 8:30 p.m. starting January 8, 2013 and run through April 25, 2013. The fee for the entire course, including all handout materials, is $125 per student. Students may attend classes on a drop-in basis at a rate of $10 per evening session. Pre-registration is preferred by contacting Cheryl Francis at (401) 254-3110 or cfrancis@rwu.edu. The Providence Boat Show is being held Friday, January 18 from 10:00 a.m. to 9:00 p.m.; Saturday, January 19 from 10:00 a.m. to 9:00 p.m.; and Sunday, January 20 form 10:00 a.m. to 5:00 p.m. at the Rhode Island Convention Center. Contact Lisa Knowles, sales manager, Newport Exhibition Group for booth space or information at 401.846.1115 or at lknowles@newportexhibition.com . The January Rhode Island Saltwater Anglers Association (RISAA) seminar will be held Monday, January 28, 7:00 p.m. at the West Valley Inn, 4 Blossom Street, West Warwick, RI. Topics to include First Aid for Fishermen by Gary Johnson a 26 year veteran with the Coventry Fire Department and 29 years as an EMT/Cardiac. Dennis Zambrotta will be the second speaker addressing Surfcasting Block Island. Dennis has been surfcasting for stripers for the past forty years and is author of “Surfcasting Around The Block”. Public is invited to attend with a $10 donation to the scholarship fund, RISAA members no charge. The Rhode Island Marine Fisheries Council (RIMFC) is in need of two scientists on the Council. The Council meets about nine times a year making policy and regulation recommendations to the DEM director for both commercial and recreational fishing. Meetings are held at the URI Bay Campus, Narragansett. All types of scientist or people involved/interested in the science of fisheries and the ocean are welcome to apply. Robert Ballou, assistant to the DEM director said, “It is not necessary to be a marine biologist to be nominated for these council seats.” The Council consists of three recreational and three commercial fishing representatives as well as two scientists. Contact Robert Ballou at robert.ballou@dem.ri.gov or 401.222.4700. DEM is having a series of RIMFC advisory panel meetings that impact fishing. The status of fisheries, policies and regulations that work their way into DEM species management plans are discussed at the meetings. So, now is the time to let your voice be heard by attending advisory panel meetings. Striped bass panel was scheduled for January 8; the ground fish advisory panel January 10; the whelk committee meeting January 15; and the Atlantic Menhaden panel set for February 11. Visit www.dem.ri.gov (Marine Fisheries page) for agendas. Cod fishing good: With high winds and seas, charter and party boats have had difficulty getting out fishing for cod. This catch of cod was landed by angler Frank Gionfrido and anglers on the Lady K out of Snug Harbor. I spoke with Bob Ballou, assistant to the director of the Rhode Island Department of Environmental Management, and Rick Bellavance, president of the RI Party & Charter Boat Association about the December 14, 2012 Atlantic Slates Marine Fisheries Commission’s (ASMFC) deliberations and votes on Amendment 2 concerning the management of Atlantic Menhaden coastwide. Ballou and Bellavance along with Bill McElroy, treasure of the RI Lobstermen’s Association, represented Rhode Island at the ASMFC meeting. Captain Bellavance said, “The Rhode Island delegation has one vote… so the three of us deliberate, come to a consensus and then cast our vote.” Bellavance continued, “There were diverse opinions and proposals on the issue… industry processors of Atlantic Menhaden (primarily Omega Protein that catch 80% of all Atlantic Menhaden) were advocating for a 10% reduction and on the other extreme some environmental groups were advocating for a 50% reduction. We came to a consensus at 20% and ultimately cast our vote in favor of this reduction percentage.” Throughout the course of the meeting many voters were taken, some Bellavance said to facilitate discussion on the issue to ensure all points of view at the table were heard. Many in the recreational fishing community in Rhode Island were disappointed at the 20% reduction approved by the ASMFC. The Rhode Island Saltwater Anglers Association (RISAA) was advocating for a 30% reduction and Don Smith an ASMFC Atlantic Menhaden panel member and RISAA member said, “At the Baltimore meeting, we were advocating for a 25% reduction and could not understand why the Rhode Island delegation was settling for less." Robert Ballou of DEM took the time last week to outline in detail what happened at the ASMFC meeting and its impact on the Rhode Island Atlantic Menhaden fishery. Here is what he had to say. 1 1. It resulted in the adoption of a first-ever coastwide quota (total allowable catch, or TAC) for menhaden, reflecting the ASMFC’s commitment to end overfishing and achieve long-term protection and sustainability for this ecologically important species, and the people who depend on it. 2 2. It resulted in a new coastwide quota set at 80% of the average coastwide landings of menhaden over the three-year period 2008-2011 – i.e., 80% of 470 million pounds = 376 million pounds. 3 3. It resulted in a state-based allocation program, which allocates the new coastwide quota according to the average percentage of each state’s landings over the three-year period 2008-2011. At the day-long Board meeting, the Board decided upon the various issues via a series of 40 separate votes. Menhaden migrate in and out of RI waters on a regular basis, and are an important component of the RI marine ecosystem. The adoption of new coastwide measures aimed at increasing protection of menhaden, with particular recognition of the important role they play as forage fish, is consistent with RI’s long-standing interests vis-à-vis sound conservation of marine fishery resources. RI’s landings over the past ten years have generally ranged from about 5,000 pounds to about 100,000 pounds. In 2008 -- a banner year, and an anomaly – 269,000 pounds were landed. RI’s average annual landings over the past three years have been about 87,000 pounds. The vast majority of RI’s landings are taken by a handful of fish trap operators operating in RI waters in the lower Bay and along the southern coast. RI will need to adopt new state regulations for 2013 to manage its new 75,000 pound state allocation. While this will likely involve the imposition of constraints on the fish trap operators, the constraints will likely be modest, since the State’s allocation is only slightly less than average annual landings over the past few years. Moreover, the adoption by ASMFC of a 6,000 pound menhaden bycatch allowance for non-directed fisheries, not to be counted against the state quotas, will provide considerable flexibility to the fish-trap operators, and will help to minimize discard mortality. Here is a link to the ASMFC website that summaries meeting deliberations: http://www.asmfc.org/press_releases/meetingWkSummaries/2012/dec14_2012AtlMenhadenBoardPR_Motions.pdf . A meeting of the Striped Bass Advisory Panel of the Rhode Island Marine Fisheries Council will be held Tuesday, January 08, 6:00 p.m. at the URI, Graduate School of Oceanography, Coastal Institute Building, Large Conference Room, South Ferry Road, Narragansett, Rhode Island. Agenda items include a striped bass stock status, the 2012 RI fishery, a review of ASMFC Addendum III to Amendment 6 for the management plan as well as fish trap and commercial seasons and quota allocations. At this meeting, members of the Advisory Panel can submit new proposals for the 2013 fishing season. For more information, please contact Nicole Travisono at (401) 423-1940. Cod fishing is good. Angler Frank Gionfrido recently fished for cod on the Lady Kay out of Snug Harbor (www.ladykcharters.com). 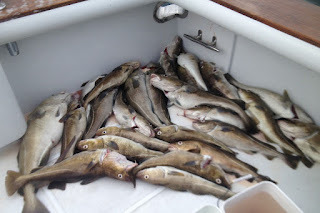 Gionfrido said, “In no time at all we arrived on the fishing grounds south of Block Island… We caught cod non-stop for the next three hours with an occasional Sea Bass (all released) and dog fish. Daphine was high hooked with a 21 pounder followed by Capt. Steve with a 14 pounder and my biggest was 11. All tallied we kept 29 cod (and) released four shorts…”. At press time the Francis Fleet and Seven B’s party boats have not been able to get out due to high winds and rough seas. Visit them at www.francesfleet.com and www.sevenbs.com for information, schedules and reports.